Directions: From the Federal Highway, exit into Jalan Utara. Go pass Crystal Crown Hotel and turn right at the traffic lights. Turn left at the junction where the blue Menara CSM / Jaya Supermarket building is situated. Digital Mall is the building at the next corner, opposite RHB Bank. From Damansara or Taman Tun, take Jalan Dato Abu Bakar through to Jalan Kemajuan. The shopping complex is also known as Menara SM and the Menara Bakti high-rise apartment building is behind and above it. Parking on the road is haphazard with many vehicles double-parked all the time. It is better to park at the basement parking in Jaya, at the MBBJ multi-storey car park behind the market / food court or in the Digital Mall building itself. 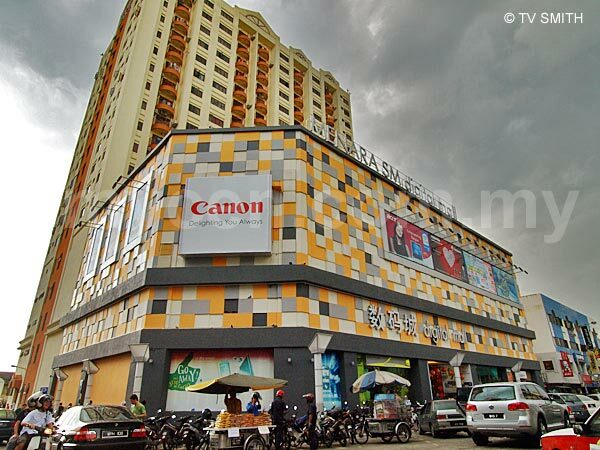 Info / Insights: Located in the commercial area of Section 14, the building is owned by SM Digital Mall Sdn Bhd. The building was previously occupied by Metrojaya. Digital Mall opened in January 2007 and adopts the IT-centric concept of Low Yat Plaza, although at a smaller scale. All four floors have shops selling PCs, Macs, PDAs, GPS devices, notebooks (laptops), memory, storage, computer accessories, parts and peripherals. Like most shopping centers, the ubiquitous mobile phone shops are there too. The mall has a net lettable area of 49,829 sq.ft. with 100% occupancy. Wi-fi is availble on all floors. All-IT Hypermart claims to be the largest computer retail centre in Malaysia, occupying the entire third floor of Digital Mall. The property landscape in the area is changing very rapidly. The blue Jaya landmark will soon be demolished for re-constructing a bigger and taller replacement. Further down the road, the new Quill 9 @ PJ Semangat is scheduled for opening in September 2008.